We had a settled night in Nijkerk as the wind moderated and it was brighter this morning. Max was anxious to have his morning walk and so I took him for a long one up to the edge of the shore to see the wide expanse of the Nijkerkernauw water with its resort beaches lining the far bank. 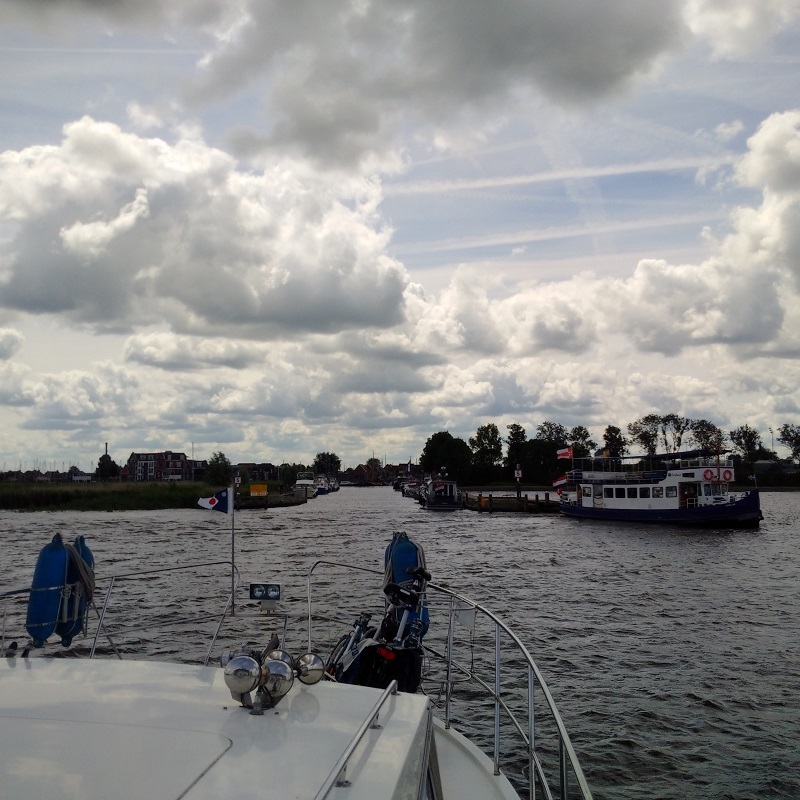 He then accompanied us as we cycled along the Arkervaart which, together with its detours, then took us into Nijkerk. As well as the moorings in the entrance channel being renewed a year or two ago, the town centre of Nijkerk had been modernised to a great extent with a fine shopping precinct with pavement cafes, but the old mooring basin is much the same with its toilet building still seeming to be a like a portakabin! At least there is water there and a place to moor near the town centre, but the barges still stop at a processing plant which is right opposite the municipal moorings! The new town square looked good on a sunny day; lots of people sitting out on the pavement cafes and we joined them after finding some water for Max to drink following his long run. We took advantage of the special offer deal of a small piece of apple cake with cream and coffee for €2.50 each and enjoyed it immensely. I then cycled off in search of the tourist office but, unhappily, they had no sticker of the place, as it is not regarded as a tourist resort, and so we embarked upon the cycle ride back, finding it a little more difficult as we were against the breeze and also because I kept having to stop and check our route on my phone. Once back, I started the engines, prepared Lady Martina to move on, deflected the complaints of a neighbouring boat about our exhaust and then made way towards Spakenburg; our next port of call on the Eemeer after passing along the Nijkerkernauw. 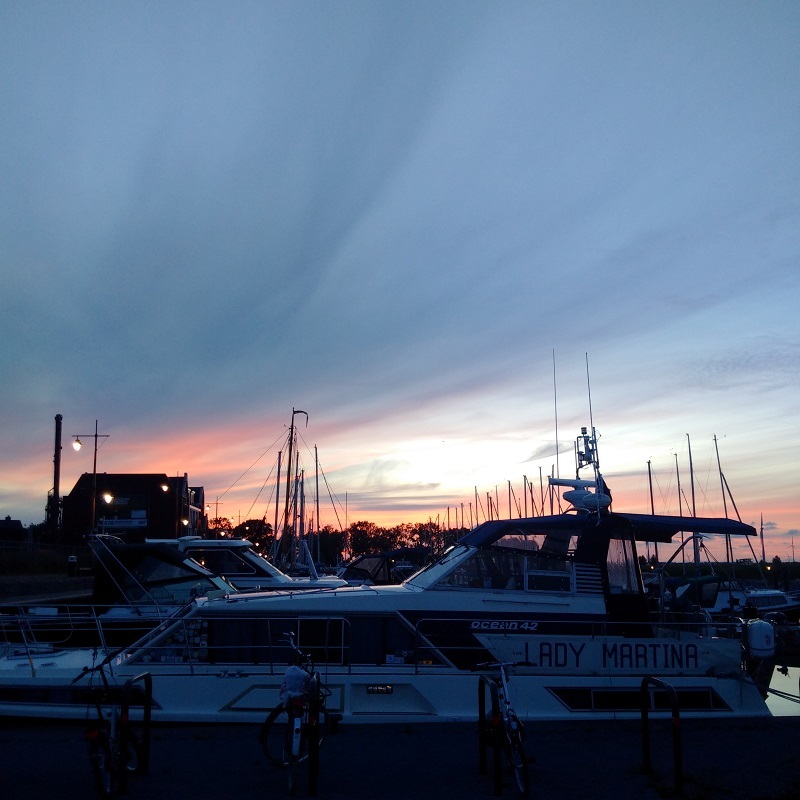 It was a short and pleasant trip in much more benign weather conditions with the sun shining at times and our entry into Spakenburg was easy enough, but without too much success at securing a mooring on the channel. I investigated the inner harbour, which was just for traditional wooden botters and then settled for a mooring in the WSV de Eendrecht where at least we could get water and electricity by SEP card, even if their WiFi did not reach the end of the moorings and I had to log into KPN-fon, my regular fall-back. A relaxing afternoon in the sunshine eating, drinking and catching up with writing before an evening excursion. 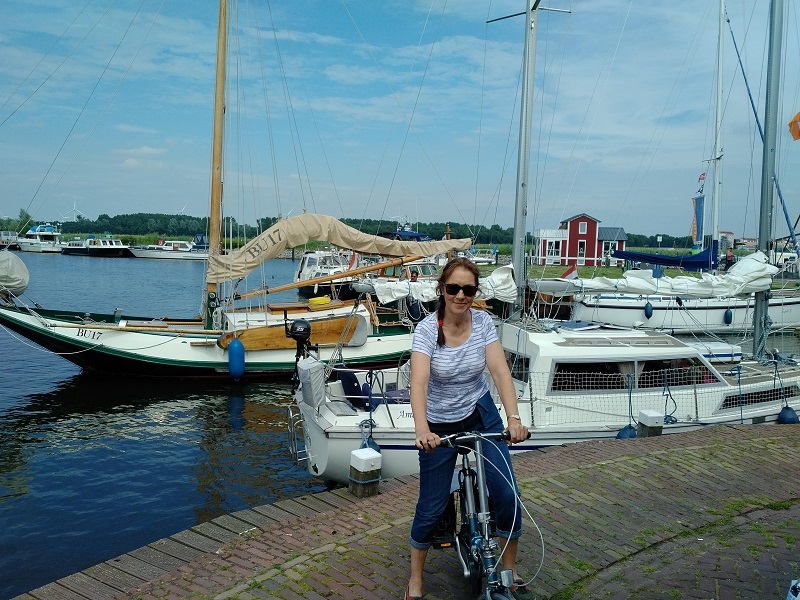 I was able to send a message to our Dutch friend Inez about where we had ended up and she will join us on board for the night tomorrow when we will cruise to Huizen the day after.